DO YOU HAVE CONNECTED HEALTH OR MHEALTH RESEARCH RESULTS TO SHARE WITH AN INTERNATIONAL AUDIENCE? WOULD YOU LIKE TO PRESENT YOUR FINDINGS IN A POSTER FORMAT TO MORE THAN 3,000 HEALTH AND INDUSTRY LEADERS? ARE YOU EAGER TO BE IN BOSTON, A HUB OF HEALTH AND INNOVATION, IN OCTOBER? Here is your opportunity to apply to present a poster at the 2018 Connected Health Conference (CHC18), October 17-19, 2018 at the Seaport World Trade Center, Boston, Massachusetts. Combining the industry's two leading events—the Partners Connected Health Symposium and the PCHAlliance Connected Health Conference—CHC18 will convene an unmatched audience of the top movers and shakers, frontline healthcare providers, and forward-thinking companies. This can’t-be-missed event will be the best opportunity to rub elbows with decision makers, gain market knowledge, learn about the latest technologies and get a front-row seat to the future of technology-enabled health and wellness. Co-hosted by Partners Connected Health and the Journal of Medical Internet Research (JMIR), abstracts will be accepted starting June 29, 2018. The deadline has been extended to 5 PM EST on August 9, 2018. Academics and Researchers working on topics related to Connected Health and of interest to conference attendees. An abstract (up to 500 words) that includes: a Title, Background, Objective, Methods, Results, and Conclusions. Poster presentations should be relevant to the Connected Health Conference theme: Balancing Technology and the Human Element, including: integrating digital technologies into healthcare delivery, wellness, and daily living; focusing on the human elements of caring, judgment and emotional intelligence; supporting cooperative care with patients; improving health outcomes, enhancing patient-doctor relationships, and enabling a critical shift to prevention, wellness, and self-care. The poster session is not intended for businesses to advertise products or services. The poster submission website will open for submissions on June 29, 2018. The submission deadline has been extended to 5 PM EST on Thursday, August 9, 2018. Prepare your abstract. You can find examples of abstracts and posters from the 2017 Connected Health Conference on the iProceedings website (http://www.iproc.org/collection/view/522). Submit your abstract using the iProceedings website (http://chc.iproc.org). Detailed instructions are provided on the iProceedings website that will guide you through the online submission process. Abstracts will be accepted based on the recommendation of an independent peer-review panel. Accepted presenters will be notified no later than August 27, 2018. Poster abstracts and posters will be published online in iProceedings (http://www.iproc.org), free of charge. One complimentary registration to CHC18 will provided per poster for the presenting author’s use. A discounted rate of $250 to CHC18 will be provided to a designated number of poster co-authors on the team. All accepted posters are eligible to be published in a JMIR publication at a reduced rate. iproc (iproceedings) is a peer-review and publishing platform for conference papers, abstracts, posters, and presentations. JMIR Publications partners with leading conferences such as Medicine 2.0 or the Connected Health Conference to provide peer-review and editing services, and/or to publish proceedings, posters, or abstracts. If you are a conference organizer or conference chair running a leading medical or technology conference, and wish to outsource the submission and peer-reviewing process, or are interested in hosting a virtual poster show or wish to publish electronic proceedings, or if you are looking for a permanent and open dissemination venue for presentations at your conference, please contact us to discuss partnership options. Starting in 2017, we will also accept individual submissions from researchers who wish to disseminate their poster presented at a major peer-reviewed conference. Background: Adding physical activity to a weekly routine has been shown to contribute to both delaying onset and improving management of existing chronic conditions. With physicians a highly trusted source of advice and care, the physical activity recommendations received from doctors may be adhered to more than other sources, especially when advice is tailored to patients’ specific physical conditions and limitations in increasing activity levels. Yet a survey by Smith et al found that fewer than 50% of clinicians were able to provide specific guidance on physical activity. This issue may stem from physicians rarely having objective physical activity data to inform their counseling. Objective: We aimed to understand physician perceptions of the potential benefits and challenges of integrating trackers in a clinical setting to provide tailored counseling to patients on increasing physical activity. Methods: Our study consisted of two phases: an online survey and in-depth, key-informant interviews. We recruited 60 clinicians to complete a 50-question survey and recruited fourteen primary and specialty care physicians for 15-20 minute in-person or phone interviews. Results from the survey were tabulated through Google Forms, while the interviews were recorded and then analyzed for emerging themes. Results: Fifty-seven percent of the fourteen interviewed physicians reported that objective data would be useful in counseling their patients on physical activity. Three-quarters (77%) believed that advice based on an objective data display would be actionable for the patients. Of the 60 clinicians who completed the online survey, only 14% believe their patients are adhering to their physical activity recommendations. More than half (57%) of respondents believe that objective data collected from a tracker would be useful in counseling patients. However, when asked how likely they would be to recommend a tracker to a patient, 43% replied they would recommend a tracker to help motivate patients to make a lifestyle change. From the interviews and the survey, the majority of physicians believed that their biggest barrier is limited time for reviewing data, yet they also expressed strong interest in well-designed displays with a small number of data points highlighting physical activity since the patients' last visit. Conclusions: The majority of physicians in our study believed that integrating tracker data into clinical settings would improve their ability to make personalized recommendations to patients, but also noted that significant barriers exist, most notably time. Future research is needed to 1) create and test condensed tracker data displays to determine physician willingness to view and use them, 2) evaluate the impact of the displays on physicians' ability to provide tailored advice to patients, and 3) evaluate the impact of tailored advice on increases in patients' physical activity levels. Background: Mindfulness training may improve quality of life (QoL) among women diagnosed with breast cancer, yet barriers associated with instructor-facilitated training (eg, cost, location, time) may limit uptake. Self-directed mindfulness training using smartphone apps may overcome these barriers. However, little is known about who may be most likely to engage in app-based mindfulness training (AMT) interventions. Objective: We examined baseline predictors of app engagement among women diagnosed with breast cancer (≤5 years) enrolled in a randomized controlled trial (RCT) of a commercially available AMT intervention (Headspace). Methods: Participants (n=57) received AMT as part of a 12-week RCT. Headspace was available for download from iTunes or Google Play. Participants were asked to complete app registration using a unique activation code and complete ≥ 1 mindfulness session; this was defined as “minimum dose.” Overall, AMT engagement was self-guided. Participants completed baseline measures of QoL (FACT-B), dispositional mindfulness (MAAS), pain severity and interference (BPI-sf), and demographics. Log data was obtained from the app developers at the end of the study. AMT engagement was characterized by: attaining minimum dose, number of mindfulness sessions completed, and duration (minutes) of overall mindfulness practice. Results: Overall, 34 participants completed app registration and ≥1 mindfulness session (minimum dose). Over the 12-week trial, the median number of mindfulness sessions completed was 11.50 with a range of 1-87 sessions completed. Median duration of overall mindfulness practice was 115 minutes, with a range of 10-1411 minutes. Participants who attained minimum dose had greater baseline physical well-being (mean 20.74 [SD 5.67]) compared to those who did not have any recorded engagement with AMT (mean 16.43 [SD 8.15]; t[36.2]=-2.20, P=.04). Pain severity was lower for participants who attained minimum dose (mean 3.12 (SD 1.69]) compared to those who did not (mean 4.61 [SD 2.05]; t=2.20, P=.04). Other domains of QoL, dispositional mindfulness, pain-related interference, and demographics did not differ between groups. Among those who attained minimum dose, only pain-related interference was associated with fewer mindfulness sessions completed (P=.05). Conclusions: App engagement was not recorded for slightly fewer than half of participants (ie, did not complete registration and ≥1 mindfulness session). Although reasons for non-adherence are unclear, findings suggest physical well-being and pain-related factors may be associated with participant AMT engagement. Given mindfulness practice time is associated with mindfulness skills uptake, future studies should explore approaches to optimize AMT engagement among participants with greater physical well-being and pain-related concerns. Background: Mood disorders and substance use disorders (SUDs) co-occur at a high rate. Individuals with co-occurring mood and substance use disorders are less likely to complete treatment. Of those who receive treatment, many do not receive adequate care that addresses both disorders. Integrated Group Therapy (IGT) is an evidence-based psychosocial treatment that treats both mood disorders and SUDs, stressing the similarities and relationship between the two disorders. Although IGT is an effective treatment for individuals with mood and substance use disorders, it is not widely available, and for those who do receive IGT, there is no in-the-moment support. Objective: A mobile version of IGT would increase access and provide in-the-moment support for individuals when they need it. The aim of this study is to use exploratory, qualitative user-centered design methodology to interview and observe end users and clinicians who treat individuals with mood disorders and SUDs to inform the design of the mobile app. Methods: Qualitative interviews were conducted with 5 patient participants who were currently receiving treatment for a co-occurring mood and substance use disorder, and 5 clinicians with experience treating patients with mood disorders and/or substance use disorders. All participants completed a short survey to assess demographic information and technology use. Additionally, observations were conducted at 3 IGT inpatient and outpatient groups to triangulate findings across methods. Interviews were audio-recorded and transcribed. Transcripts and field notes were analyzed using thematic analysis using NVivo for Mac (version 11). Results: Patient participants were predominately male (3/5, 60%), age 45-64 (4/5, 80%), unemployed or disabled (3/5, 60%), and white (5/5, 100%). The majority of clinicians were female (4/5, 80%), age 26-44 (5/5, 100%), and white (4/5, 80%). Most patients (4/5, 80%) and clinicians (5/5, 100%) reported feeling comfortable using technology as a treatment tool, and 40% (2/5) of patients indicated that they had experience doing so. Key treatment themes that emerged from the qualitative data included the importance of IGT in helping patients to develop a common language to describe their co-occurring conditions and experiences, visualizing the recovery journey, the importance of independence and freedom to patients throughout treatment, along with varied acceptance and self-perception of one’s recovery journey. With respect to developing a mobile tool, reported patient needs included: in-the-moment support, peer-to-peer support, after-care planning, maintaining structure post-discharge from treatment and opportunities to practice skills. Clinicians corroborated the need for patient peer-to-peer support, help with after-care planning and the opportunity to practice skills. Conclusions: Patients and clinicians were open to the idea of using technology as part of treatment. Several themes emerged to inform the direction of a minimal viable product (MVP) of the app. Next steps include narrowing down to key themes to focus on for the MVP, defining features as relevant to those themes, designing a clickable prototype of the app and conducting iterative feedback sessions with end users. Background: The vast majority of digital and mHealth applications are developed in English. In the United States, there are 52 million Hispanic people, over half of whom speak Spanish at home. In Latin America, there are nearly 400 million people online. To date, the majority of digital health solutions are either only in English or simply translated into Spanish or other languages, ignoring the cultural relevance and nuances of the target audiences. Culturally adapting digital health solutions may lead to increased engagement, utilization and effectiveness, but there have been few empirical studies comparing culturally adapted digital health solutions to simply translated ones. Objective: 1) Compare the engagement and usage of culturally-adapted digital health content and programs that have been translated into Spanish with those that have been further culturally-adapted. 2) Generate guidelines for “best practices” for digital and mHealth developers seeking to engage US minority, multicultural and/or International audiences. Methods: HolaDoctor built and operates the largest Spanish language health website on the internet, with 3 million unique visitors per month. In partnership with Consumer Reports Health, we tested translated versions of CR articles into Spanish with culturally-optimized versions that incorporated Hispanic imagery, examples, beliefs and Spanish-only phrases. In a separate study, we conducted a large randomized trial of over 1000 Hispanic health plan members in collaboration with three Blue Cross Blue Shield Plans, and compared a culturally-adapted health and wellness program with a bilingual, non-culturally adapted healthy weight program. The culturally adapted version was further tested and evaluated at scale in a state-wide Hispanic Obesity Prevention and Education (HOPE) program with the Florida Department of Chronic Disease. Results: In comparison of a series of digital Consumer Reports articles, we found that the culturally adapted versions of the articles led to a 2x to 10x increased engagement and use than the translated only version. For example, with one article the translated only (TO) compared to the culturally adapted (CA) version received: 1499 (TO) vs 29,157 (CA) page views; an exit rate of 81% (TO) vs 20% (CA) and 3 (TO) vs 52 (CA) social shares. In the randomized trial, the culturally adapted version of the healthy weight program led to twice the engagement, twice the number of changes in positive healthy behaviors and a statistically significant in an intent to treat analysis greater weight loss 0.23 (TO) vs 0.52 lbs/week; P<.03) over the 3-month study period. In the Florida HOPE program, we found that cultural adaptation led to significantly increased consumption of fruits and vegetables and daily physical activity. Conclusions: With now nearly 100% penetration of smart phones, digital health and mHealth solutions offer great promise for narrow the health disparities gap between the underserved multicultural populations and the general population. These solutions are also increasingly “going global.” Simply translating digital and mHealth applications is better than English-only, but falls far short of the highly personalized, culturally-tailored solutions are capable of. Best practices for culturally-adapting digital health solutions at an affordable cost will be shared. Background: Tobacco use entails, during pregnancy, a serious risk to the mother and harmful effects on the development of the child. Europa has the highest tobacco smoking prevalence (19.3%) as compared to a worldwide mean of 6.8%. Twenty to thirty percent of pregnant women used tobacco during pregnancy worldwide. These data emphasize the urgent need for community education and implementation of prevention strategies focused on risks associated to tobacco use during pregnancy. 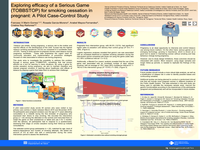 Objective: This study aims to investigate the possibility to address this problem through a serious game (TOBBSTOP), something that has proven efficient as a tool for learning in many situations. By using a game for smoke cessation during pregnancy, we aim to maintain cessation and interest pregnant smokers in learning about health care and effects of tobacco by playing a game that helps them to achieve their challenge. Methods: A pilot case-control study enrolls 44 women who were visited in two primary care centers in Spain between March 2015 and November 2016. All participants were pregnant smokers over the age of 17 years attending consultation to a midwife during the first trimester of pregnancy who expressed their desire to stop smoking. We recruited the intervention group (n=22) among the attended on the centers and instructed them to install the game on their smartphone or tablet and use it for 3 months. Until the delivery, all participants had to respond to a questionnaire, assessing their stage on smoke cessation during their follow-up midwife consultations. The selected control group participants (n=22), matched for age, level of tobacco-dependence and number of smoking attempts. We tested the amount of CO at each visit with a carboxymeter during the entire intervention period to assess the abstinence. Results: Pregnant women from the intervention group, with 80.0% (12/15), had significant higher rates of cessation until delivery than control group (χ2=8.4; P=.004). Logistic regression analyses revealed that game’s use was associated with an increased likelihood to maintain smoking cessation during the intervention period compared with those not using the game (odds ratio 4.0; 95% CI 1.3-12.2). Additionally, a Mantel-Cox means’ analysis revealed that the use of the game was associated with an increased number of days without smoking, with an average of 139.7 days (95% CI 97.1-182.4) in the intervention group (χ2=13.912; P<.001). Conclusions: Pregnancy is an ideal opportunity to intervene and control tobacco use among future mothers. On the other hand, serious games is an emerging technology, growing in importance, which is shown as a good tool to assist in maintaining women without smoking and help behavior change during pregnancy. However, due to study design limitations, these outcomes should be interpreted with caution. More research, using larger samples and longer follow-up periods, is needed to replicate the findings of this study. Background: Many mobile apps have been designed to monitor physical activity. While they may have many downloads, most users eventually stop using the app and become disengaged. We created a hyper-personalized physical activity tracking app to promote engagement with physical activity (PA) among users. It is unknown if this increased engagement and how engagement level may affect measured outcomes. Objective: The purpose of this study was to determine how users engaged with a hyper personalized activity tracking app for 6 months and whether this engagement affected physical activity Methods: Participants with cardiometabolic risk (CMR) factors were given an activity watch to track their PA (step counts) and asked to use the study mobile app for 6 months. App features included step tracking, personalized educational and motivational messages, biometric tracking and connection to a portal where their clinician could monitor their activity. App usage data were collected at 3- and 6-month study visits to determine app usage metrics for the 6 months. App engagement was determined by app usage metrics such as overall page clicks (number of clicks per page), frequency of use of individual features (number of clicks) and session length (time spent on a page). Participants were grouped by level of engagement with app (high, medium, low, none) post hoc to determine engagement effects on steps. Results: Information was collected on 128 participants. Over the 6-month study, 60 participants (47%) engaged with the app. Among users, app usage decreased by over 50% with the highest app usage during month 1 followed by month 4. There was no difference in the average app session lengths at 0 and 6 months (12 vs 11 seconds, respectively). The most commonly viewed feature was the personalized daily messages (92% of participants used feature, 20,902 clicks, 58% of total views). At least 85% of app users engaged with all the features. Each additional day of app use was associated with a nonsignificant increase of 13 steps in overall average daily step count. Median days of app use were used to define groups with high, medium, and low engagement (median 89, 35 and 3 days of use respectively). The low engagement group had an average 1220 less steps per day than the high engagement group (P<.001). High engagement group’s session length remained steady through the study period, compared to medium engagement group’s session length that fluctuated widely. While steps decreased over the 6 months, those in the medium engagement group decreased in weekly step counts at a steeper slope then other engagement groups. Conclusions: While participants engaged with most app features, we observed a 50% decrease in engagement over the 6-month study. Despite this result, those with high engagement were able to achieve more physical activity than those with low engagement. This increase in physical activity may lead to improvements in CMR factors and better quality of life. Background: Frequently recurring tension headaches, migraines, and orofacial pain affect over 2.4 billion people worldwide, representing the second most prevalent medical condition in the world. In-office behavioral therapy (ie, relaxation and mindfulness exercises) has been shown to be one of the most effective treatment options for these patients. However, it has been underutilized due to stigma, cost, and accessibility. Mobile health apps may be one way to provide accessible, lower cost care in a nonstigmatized environment. As a result, apps are becoming an increasingly popular method for delivering behavioral therapy interventions and may provide an effective means to reach this population. Objective: The aim of this study was to assess the feasibility and acceptability of delivering a clinically validated behavioral therapy for migraine/headaches through a mobile app. Methods: Twenty-one migraine or headache sufferers met the criteria for severe migraine disability determined by the MIDAS test. Participants completed a two-week baseline period in which they kept a daily headache diary through the Halo app. They then began a four-week intervention period. During this period they were instructed to complete ten minutes of relaxation training exercises provided by the app each day, as well as monitor headaches via the daily headache diary. Relaxation training exercises consisted of various breathing techniques, progressive muscle relaxation, and mindfulness. Headache frequency was tracked throughout the intervention period, and further assessments, such as an in-person interview and posttreatment MIDAS test, were completed at the end of the four-week intervention period. Results: Analysis of data showed that there were significant differences between baseline scores (Headache Frequency Average=11.47/mo, MIDAS average=25.4) and postintervention follow-up (Headache Frequency Average=6.63/mo, MIDAS average=11.7, Frequency P<.01, MIDAS P<.01). Postintervention interviews revealed that more than 90% of the participants felt that the Halo beta app was easy to use and provided a benefit to the user. More than 85% of participants enjoyed using a daily headache diary and felt it gave them greater insights into their condition. More than 90% of the patients felt that the relaxation training had helped reduce the frequency of their headaches or headache related disability. Conclusions: We found that mindfulness and relaxation-based interventions administered through the Halo beta app was a feasible and acceptable treatment for people suffering from frequently recurring headaches and migraines or disability associated with headaches and migraines. The pilot demonstrated the potential feasibility and usability of a mobile health app in delivering behavioral therapy for headache and migraine as an adjunct or alternative to in-office behavioral therapy for headache and migraine. Background: Adoption and effective use of digital health technologies is especially important for older adults, who bear the greatest burden of chronic disease. However, some older adults lack the digital literacy skills needed to reap the benefits of these tools. Despite the greater infiltration of smartphones in all age groups, including older adults, smartphone ownership does not equate to adept smartphone use. Impediments to smartphone use can impede adoption and use of digital health technologies that rely on apps. Objective: Our objectives were to 1) determine the barriers to adoption and use of digital health technologies, specifically wearable activity trackers, by older adults; and 2) identify and test facilitators to adoption and use. Methods: We recruited more than 100 older adults aged 50-75 who owned a smartphone for our tracker studies. We provided each participant with a tracker and hands-on support for its setup and use. Support was tailored to each participant’s level of comfort and adeptness with his or her smartphone and new tracker, with the goal of having participants leave with a working tracker and an app they could engage with. Results: While all participants owned a smartphone, we identified several barriers to successful engagement with their own smartphones as well as with their new trackers. Some older model or pay-as-you-go phones could not download apps. Many participants required assistance to download and setup an app, as well as sync their tracker to the app. In several cases, the use of jargon such as “sync with Bluetooth” required an explanation. Some app features required guidance, such as changing the default of 10,000 steps to one that was more achievable and realistic for older adults. Furthermore, the design of some tracker faces and bands were preferred or more comfortable for participants. We found that once participants were able to overcome barriers to setup through hands-on training, other facilitators, such as a visual reminder of their commitment to physical activity and the immediate gratification of seeing their activity reflected in the tracker and the app, kept them engaged with the tracker. Conclusions: The digital health market is growing rapidly and has great potential to improve health outcomes, yet it is failing to reach and meet the needs of older adults. Poor digital literacy skills impede adoption of digital health technologies, and their effective use once adopted. While a high-touch approach to helping older adults overcome barriers to adoption and use of digital health technologies has proven to be a successful facilitator in our studies, the challenge is in bringing this approach to scale and applying it to both consumer- and medical-grade technologies. In future studies, we hope to build on this knowledge and further identify design and training solutions that can be scaled to increase successful engagement of digital health technologies by older adults. Background: While mobile technologies have unlocked opportunities to address health care access and affordability gaps, billions of emerging mobile users are yet to reap the benefits of connected health. Objective: We studied data enabled mobile phone ownership and behaviors amongst low income young Indian families. Our goal was to study the barriers to usage in this rapidly growing segment and how these barriers can be overcome to design meaningful health interventions. Methods: Starting with secondary research, our team conducted primary research interviews in a group of 250 young families (pregnancy or an infant in the family) within six diverse low income communities in Mumbai and Delhi. The surveyed population represents the global segment of the next billion emerging mobile users. The hypotheses generated from our research were used for rapid prototype development, testing and iteration over two rounds with similar users in Mumbai. Prototype development was informed by learnings from commercial apps used by emerging mobile users that address patchy connectivity, low data speeds and cost conscious consumers. The prototype testing included qualitative and quantitative methods. Results: Our primary research showed rapidly increasing and recent ownership of internet enabled phones (83%) in our surveyed population. 56% of users had acquired their smartphone in the last year and only 10% had owned a smartphone for more than 2 years. Phone ownership had a strong gender bias with only 39% women owned phones compared with 85% in men. Smartphone ownership was linked to monthly house income, rising from 35% ownership in households earning less than 20,000 INR to 90% in households earning 20,000-40,000 INR. Phone ownership across the same income segments increased dramatically in digitally ready neighborhoods that had a superior infrastructure and connectivity. The main reasons for not using the internet were lack of knowledge (80%), cost (57%), lack of local language content (39%) and lack of motivation (35%). Emerging mobile users were drawn to the internet primarily for entertainment (95%), social networking (82%), and online gaming (74%). Only 18% of the population was using internet to seek health care related information, and when they did, digital health information was reported as least reliable, with close to 90% of respondents ranking them lowest on the reliability scale. Our users were more likely to respond to the test mobile app when it was data light, transparent, and allowed for offline viewing and sharing. Behaviorally, reducing cognitive load significantly allowed users to make confident decisions. This meant creating linear user journeys, minimizing screen choices and nudging users towards specific messages using a combination of rewards and loss aversion techniques. Even though literate, our users responded overwhelmingly to visual and video content than to written text. Finally, activating the user journey on the app was much more powerful when done through a trusted community resource. Conclusions: Slimming down existing health apps won’t address the unique needs of emerging mobile users. Designing connected health interventions for the next billion mobile users requires multi-disciplinary teams to design content experiences and user journeys rooted in local ecosystems and tailored to the users’ unique sensibilities. Background: Pre-exposure prophylaxis, or PrEP (brand name Truvada), is a once daily medication that reduces the chance of contracting HIV by more than 90% for those facing an elevated risk of HIV exposure. When starting PrEP, it takes at least seven days to reach high levels of protection and seven consecutive days to maintain protection. Unfortunately, many do not follow the guidelines for PrEP, leaving them vulnerable. Metro Wellness and Community Centers (Metro Wellness) provides comprehensive HIV services throughout Tampa Bay. Metro Wellness, with Mail-Meds Clinical Pharmacy (Mail-Meds), deployed a new technology, Nomi, to support patients in their journey of HIV prevention. Nomi accurately captures data through a connected prescription bottle to reveal how patients take their medications in real-time. Nomi translates data into actionable information for automatic patient interventions and engagement. Objective: To understand patients’ ability to adopt innovative technology to maintain adherence to the PrEP regimen. In addition, the study will determine if technology converts non adherent days to adherent through automated, personalized interventions. Methods: Patients enrolled in Nomi must be HIV negative, at high-risk for HIV infection, receiving PrEP for the first time through Metro Wellness, and have a cell phone with SMS capabilities. Patients receive their Truvada prescription in a connected bottle that measures the amount of medication taken by weight. The prescriptions are filled by Mail-Meds in clinic pharmacy. As patients take Truvada, the bottle sends data to Nomi. Nomi reviews the data and sends automatic text interventions and escalations based on the patient’s behavior. The texts sent are designed to be discrete to ensure patient privacy. Nomi also communicates with Metro Wellness staff. Staff receive escalations from Nomi to reach out the patents needing additional assistance. Results: The program is ongoing. All reported results are as of July 31, 2018. Forty-nine patients have been enrolled. Days on therapy range from 29 to 378. The average length of therapy is 107 days. Reasons for ending therapy include, patients changing prescribers, declining therapy, and side effects. A total of 1914 SMS text interventions have been sent. Patients need an intervention 24% of the time and convert 48% (n=917) of the time. Additionally, 45% of conversions (n=412) occurred within 1 hour of the intervention. Ninety percent (n=44) of the patients responded directly to Nomi at least once. A total of 564 total responses have been received. Each patient has sent an average of 13 responses. Conclusions: Patients had no perceived barriers to adopting Nomi. In fact, patients enjoy participating and interact frequently through responses. Personalized interventions, based on real-time data, quickly change patient behavior from what would have been a missed day, to a correct day. Metro Wellness integrated Nomi and medication adherence into the daily lives of their patients, through a direct communication channel. By using Nomi, Metro Wellness staff is able to connect with their patients more frequently, building stronger relationships, which has improved adherence in order to prevent HIV infection. Background: Digital behavioral health (BH) tools can help improve or maintain BH conditions such as depression, anxiety, substance abuse, stress, chronic pain or insomnia; the efficacy of digital self-care tools can be enhanced via addition of human touch-points. Objective: The objective of this study was to evaluate the feasibility and acceptability of adding asynchronous chat-based coaching to the myStrength digital BH platform. Methods: Participants who were at least 18 years old, fluent in English and readily able to access the internet were recruited via Craigslist advertisements to participate in a pilot intervention. Participants were asked to use the digital tool at least 2 times per week and to communicate via online chat with a coach at least 2 times per week. Participants completed online surveys at 2 weeks, 4 weeks and 6 weeks, and completed a 30 minute telephone interview between 5 weeks and 6 weeks. Results: Of 226 who responded to the advertisement, 200 people were invited to participate, 134 engaged in coaching initially and 96 completed the final interview. Seventy-eight percent of participants were female, 62% were white, 23% were black, 8% were Hispanic and 6% were Asian. One-fifth were in treatment with a BH provider, one-fifth received BH care from a medical provider, and 22% were taking BH medications. In response to the question, “On a scale of 0-10, how helpful has your coach been over the past 2-weeks,” the mean score and standard deviation were 7.5±2.4 at 2 weeks, 8.2±1.9 at 4 weeks and 8.6±1.9 at 6 weeks. Satisfaction with coaching was 7.6±2.5 (out of 10) at 2 weeks and 8.3±1.9 at 4 weeks. Participants felt that coaching increased the value of the digital tool, with a mean rating of 8.4±1.9 (out of 10). Three-quarters of participants felt that the encouragement coaches provided was the most helpful aspect, followed by guidance to specific resources (53%), support (51%), connection to another person (42%), and assurance (40%). These findings were corroborated in the qualitative data; participants emphasized the value of having personalized suggestions amidst a large breadth of content, an outside perspective, and greatly appreciated the “human contact in a digital world.” The coach-patient relationship strengthened over time (2-weeks vs 6-weeks): 78% vs 93% felt that the coach discussed things that were important to the participant; 78% vs 90% felt that the coach liked and understood them; 85% vs 93% felt the interaction with their coach was helpful; 77% vs 88% had confidence in the working relationship with their coach (all P<0.05). Eighty-one percent of participants reported that they would prefer to work with the same coach over time whereas 19% would have preferred to talk with a coach in real time. Conclusions: The addition of asynchronous coaching to a digital BH platform was well received, perceived as helpful, and promoted a more personalized experience with the digital BH tool that improved over time; future studies will evaluate impact on clinical outcomes and engagement. The added human element helped participants feel supported in their struggles with BH issues and has the potential to help increase engagement to myStrength’s effective, evidence-based, well-being resources. Background: There is a rising epidemic of pediatric obesity in the United States and worldwide. While many factors contribute to pediatric overweight and obesity, dietary decisions are a leading cause. Children spend many hours a day playing video games, mostly on mobile devices. Hence, personalized gamification and learnification on mobile devices have great potential to influence children’s dietary-lifestyle behaviors during the habit formation stage of early childhood. In fact, video games on mobile devices have become a platform through which children learn in a fun and enjoyable way. While there is some early evidence of the positive impact of neuropsychology-based, cartoon-styled, immersive video games on healthy eating behaviors in children, the mechanisms underlying these improved outcomes are yet to be understood. Objective: To design appropriate interventions in the game environment for children’s behavior formation and change, we need to learn more about the underlying patterns of player behaviors evidenced during gameplay through techniques of machine learning and stochastic optimization. Building on prior descriptive work, this study examines the impact of a diet and lifestyle focused mobile game on children’s game play patterns and associate these patterns with their actual food choices using machine learning and statistical models. Methods: Our dataset was generated from an IRB-approved, informed consent–based randomized controlled trial (RCT) with pre- and post-treatment measurements of almost 100 school children using fooya!, a novel mobile gaming, iOS/Android based App that is being developed as a low-risk and non-invasive “digital vaccine” for lifestyle diseases, for 2 exposures of 20 minutes each. Based on artificial intelligence, neuropsychology and cognitive behavior therapy, fooya! has been shown to deliver positive outcomes with respect to food choices, self-reported dietary choices, and healthy eating intentions. We first model the process of game playing at any level across all students as a discrete, time-homogeneous, first-order Markov chain with multiple states, each representing a status of the game. Process mining identifies distinct patterns in the game sequences and statistical models establish the relationship between game patterns combined with demographic and behavioral data with actual food choices at the end of the game. Results: We find strong evidence of the positive effect of the mobile game on actual food choices, just after 40 minutes of intervention exposure (T: 2.46; C: 1.10; P<.001). Analysis of children’s play patterns shows significant variations in game play mechanics among players. Regression analyses further reveal that more engaged, dynamic, and strategic game play patterns are associated with better actual food choices. Conclusions: This study adds to the growing body of evidence that learning about healthy eating in a fun and exciting way via mobile games, acting as Digital Vaccines, can positively impact children’s actual food choices. While promising, additional RCTs in varied settings and deeper analysis of the resulting data are needed to confirm Digital Vaccines’ potential to reduce the long-term risk of nutrition related non-communicable diseases such as diabetes and cardiovascular disease, as well as health risks from the double burden of overweight vs malnutrition and under-nutrition by educating children regarding healthy lifestyle choices using mobile games.